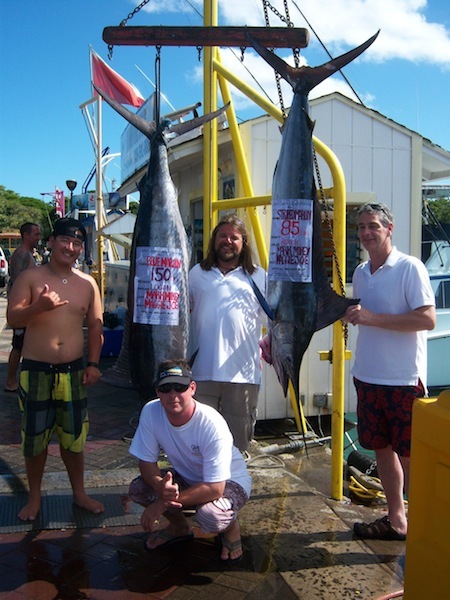 Angler Kevin, Tom and Benny with 75 lb Striped Marlin! 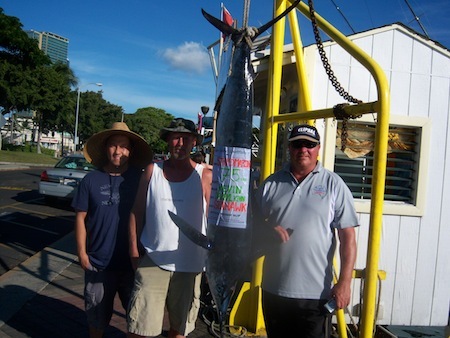 Mahalo to Kevin, Tom and Benny for choosing Maggie Joe Sport Fishing! 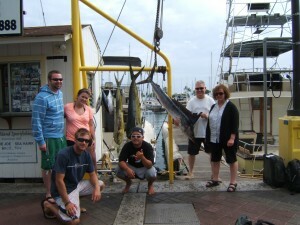 The group departed Kewalo Basin, next to Waikiki, aboard the Sea Hawk with Captain Darryl on a sport fishing charter. 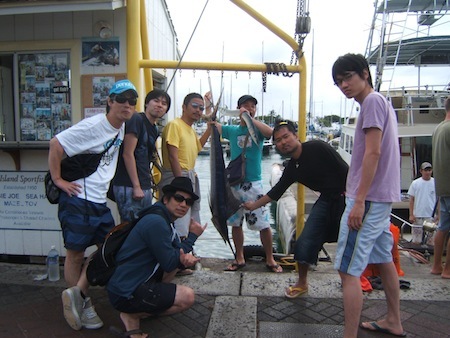 They spent the day deep sea fishing outside of Honolulu, Oahu when Kevin’s reel went off. After hopping in the fighting chair Kevin hauled in this nice 75 lb Stripey! Aloha! 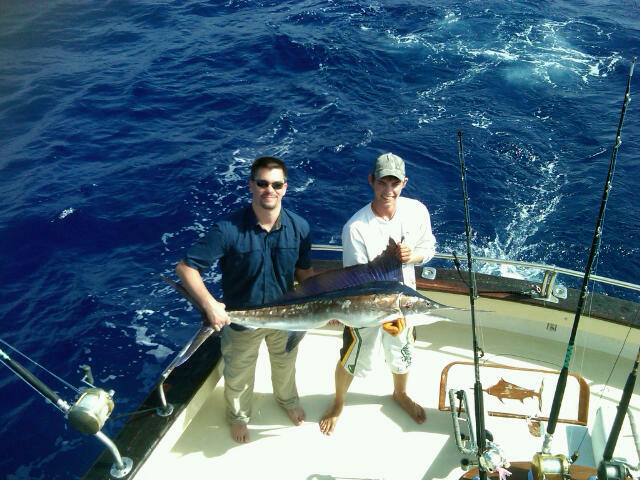 Destry and Mate Arya with 42 lb Striped Marlin on Maggie Joe back deck! 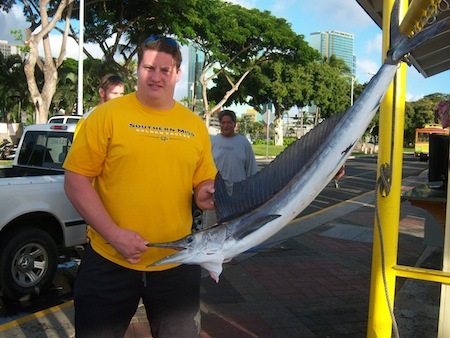 Angler Destry with 42 lb Striped Marlin! 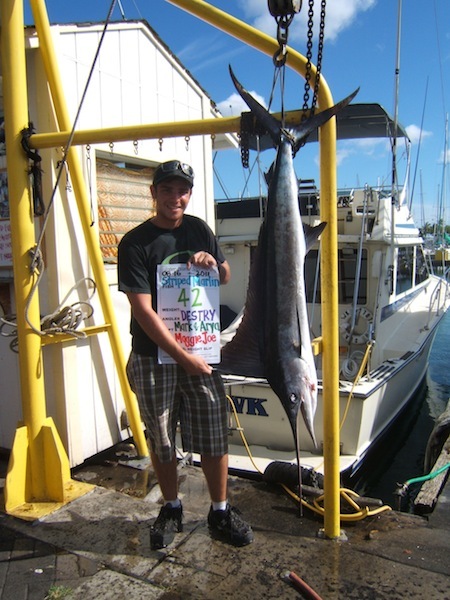 Mahalo to Destry for choosing Maggie Joe Sport Fishing. Destry departed Kewalo Basin, next to Waikiki, in the early morning of 8/16/11 aboard the Maggie Joe on a full day sport fishing charter. 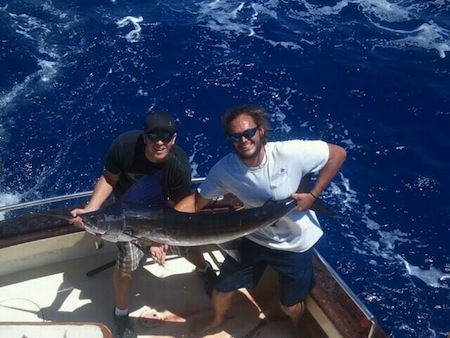 While deep sea fishing outside of Waikiki, Oahu Destry reeled in this nice 42 lb Stripey! Great job and Aloha! 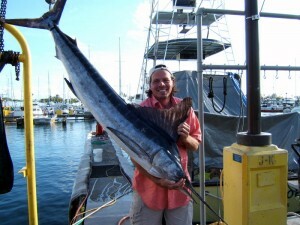 Joe reeled in this nice striped marlin on 5/13/11 while deep sea fishing aboard the Ruckus outside of Waikiki, Oahu! Joe spent the day aboard the Ruckus on a sportfishing charter adventure! 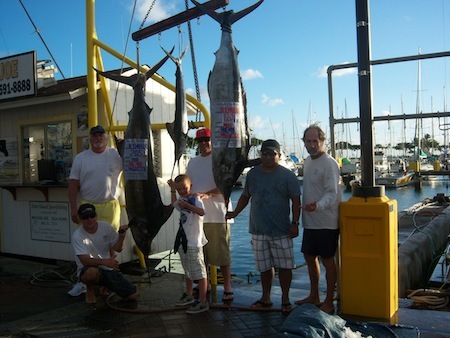 Mahalo for choosing Maggie Joe Sport Fishing on Oahu! Aloha! Captain Morgan and Mate Mikey with Lisa, Don, Lauren and Eric with catch! 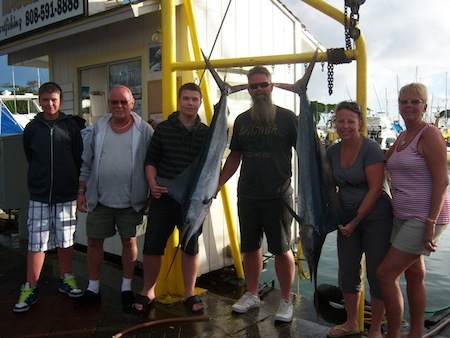 Mahalo to Lisa, Don, Lauren and Eric, joining us all the way from Canada, for choosing Maggie Joe Sport Fishing! The group hauled in 1 striped marlin, 2 mahi mahi and 3 aku while deep sea fishing outside of Honolulu, Oahu aboard the Sea Hawk! Aloha!